Those were the words of AFC Bournemouth chairman Jeff Mostyn as he personally thanked Henry Schachter for giving an insightful presentation to members of the club’s under-18 squad. 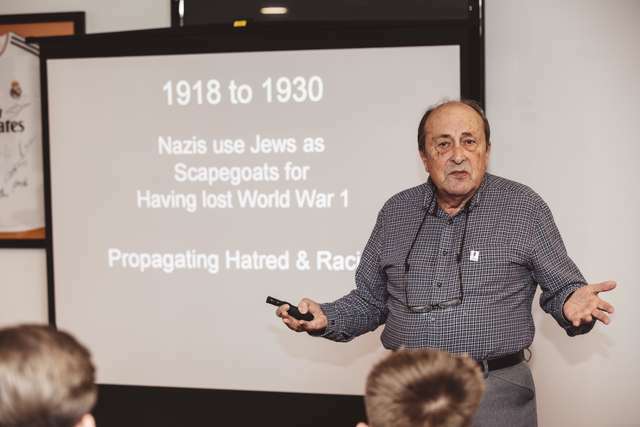 Mr Schachter, who lives in Bournemouth, had been invited to Vitality Stadium to give a first-hand account of how he survived and lived through the Holocaust of World War II. His moving and emotive story, which was accompanied by some harrowing footage, marked today’s Holocaust Remembrance Day – the anniversary of the liberation of the Nazi death camp Auschwitz-Birkenau. Although Mr Schachter survived to tell the painful tale, his Polish-born parents were less fortunate as 6,000,000 European Jews were systematically murdered by Adolf Hitler’s generals between 1941 and 1945. His father was shot dead by a guard as he attempted to make a run for it while slave labouring in a quarry, while his mother died after contracting typhoid in Belsen, one of the biggest Nazi concentration camps. Mr Schachter, one of thousands of Jewish children who was saved after being given shelter by the underground resistance in Belgium, said he had been impressed by his young audience in the Vitality Stadium boardroom. “They were fantastic,” he said. “They were engaged and asked serious questions. I could see their attention was absolute all the way through. “I speak in a lot of schools and, occasionally, you get a distraction and everybody turns around. Here, they were totally focused which is very encouraging. We need the younger generation to listen, learn and, hopefully, pass on the message. That’s what we’re all aiming for. “I want to make them aware what it actually means when they encounter racism. It’s not a joke and it’s not something you can just shrug off. Holocaust Remembrance Day is one of a number of initiatives embraced by AFC Bournemouth and members of the club’s academy will today remember the victims of the Nazis and subsequent genocides with a minute’s silence ahead of their games. As with all themed matchdays, the equality ticket allocation is used to engage with community groups or individuals from under-represented groups and the allocation for the Chelsea game has been given to Bournemouth Hebrew Congregation. Offering his own personal thanks to Mr Schachter, AFC Bournemouth chairman Mr Mostyn said: “Henry’s presentation was a stark reminder of the distress caused to families of all religions in respect of any form of racism. “Holocaust Remembrance Day is about recognising what happened and ensuring it never happens again. “Everybody connected with a Premier League football club is in a very privileged position and we are a million miles from what happened in the dark days. But the dark days are coming back. 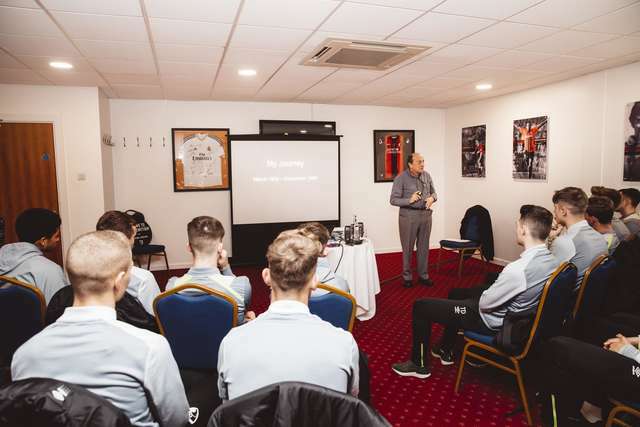 As they listened intently to Mr Schachter’s account of events, the group of academy players were made aware of how while not being able to change the past, they could certainly help shape the future. Under-18 captain Brennan Camp said: “The talk was very informative and educational. On behalf of the players, I would like to thank Mr Schachter for coming in. Ahead of Holocaust Remembrance Day, the World Jewish Congress launched a global campaign encouraging people to speak out on social media to raise awareness. The campaign urges people to hold up a sign with the words “We Remember” and post it to social media with the hashtag #WeRemember. AFC Bournemouth academy manager Joe Roach, who visited Belsen during his time in the army, said: “The Holocaust was a period of history that we would never want repeated. “It’s important for our young players to realise why we’re here and the voice we’re allowed to give because of the people who were sacrificed. Mr Schachter and his wife will be guests of Mr Mostyn when AFC Bournemouth mark Holocaust Remembrance Day with the visit of Chelsea on Wednesday.